This coffee rubbed sirloin tip roast is the perfect way to ‘WOW’ your family and friends during the holidays (or any other time of year!). 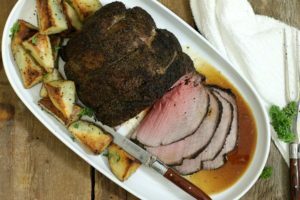 Gently roasted and crusted with a hint of coffee, this sirloin tip roast is tender, juicy, and foolproof! What Exactly Is A Sirloin Tip Roast? A sirloin tip roast is a chunk of meat taken from the rump (rear end) of the cow, just behind the sirloin (middle of the back) itself. 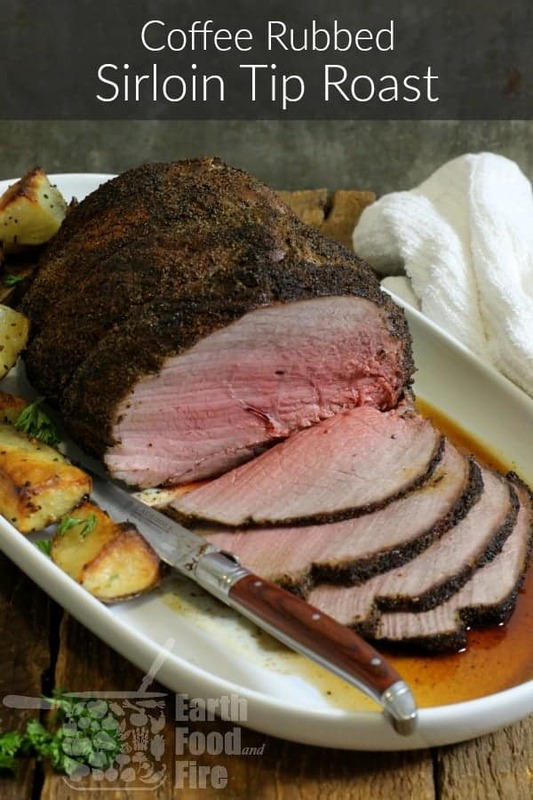 The sirloin tip is a great choice of meat for roasting. 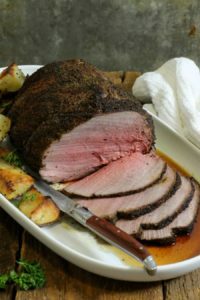 A little more expensive then an eye of round or chuck roast, but more affordable then a prime rib or tenderloin roast, sirloin tip roasts are lean and very tender if cooked properly. Because it is fairly lean, a sirloin tip roast is best gently roasted at a low temperature to ensure even cooking, and a tender roast that’s juicy and full of flavor. If you over cook it, it will come out dry, tough, and not all that pleasant, which is why I would not recommend cooking it past medium (145F) in any situation. The simple rule of thumb I followed here is to cook the roast for 20 minutes per pound of meat. The easiest way to never overcook a roast again? Use a digital oven thermometer! You can literally see how far your roast is while it is cooking! 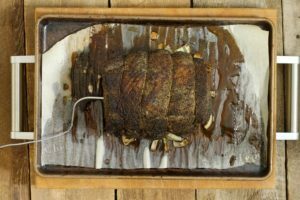 By dry rubbing the sirloin tip roast over night, you are able to infuse it with even more flavor, while at the same time ensure a rich coffee laced crust that will pop with every bite. First things first though. 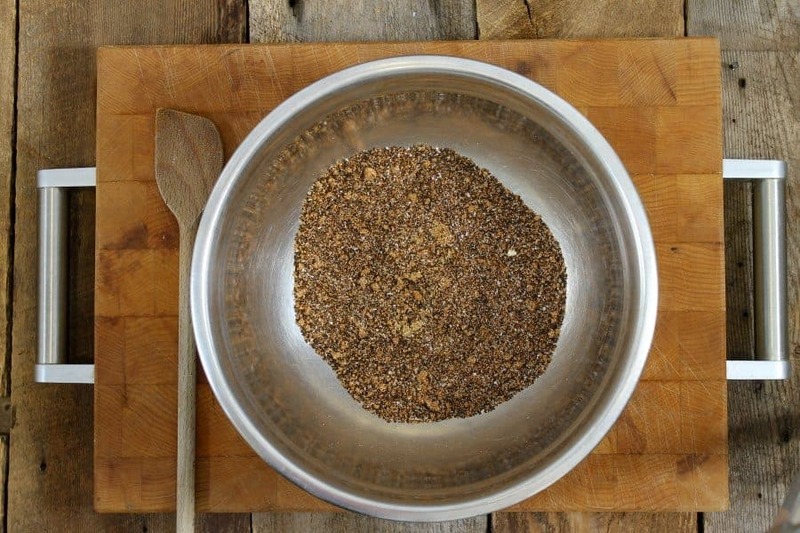 After having purchased a roast, you’ll need to mix up a batch of this coffee rub which we will use to crust the sirloin tip roast. 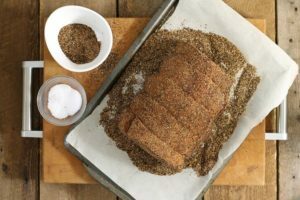 If you have a well stocked pantry with essential spices, you’ll have everything you need to make this coffee rub recipe. A straight forward spice rub, this coffee rub blends a mix of spices with finely ground coffee to ensure a smooth caffeine infused flavor to your roast. Mix all the spices together in a bowl, and reserve for later use. Once you have the roast at home, give it a rinse to wash of any blood, then pat it dry. 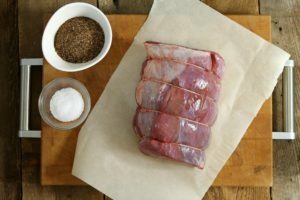 Lightly season the roast with sprinkling of salt, and if dry rubbing overnight, liberally coat the entire roast with the coffee rub mix. If not dry rubbing overnight, simply continue the recipe and skip this step. Preheat the oven to 400F and place the roast on a baking sheet. I like to rest it on a bed of roughly chopped onion, as the onion will help flavor the juice that collects in the pan. They will also prevent the bottom of the roast from burning on the sheet pan. Cook the roast in the pre heated oven, uncovered for 15 minutes, then drop the temperature to 325F and cook for 20 minutes per pound of roast. Make sure to calculate the initial 15 minutes into this calculation. So for a 4 lb roast the roast would be in the oven for 1 hour and twenty minutes total. This will result in a medium rare to medium done roast. Once the cooking time is up, remove the roast from the oven and let it rest covered with tinfoil for at lest 10 minutes. By letting the roast rest before slicing, you allow the juices to settle inside the meat. This will prevent them from running out when you do slice the roast for serving. I recommend covering the roast with a piece of tinfoil or a large dish to keep it warm as it rests on the counter. As the roast rests, pour off any juices that have collected in the roasting pan. You can use this juice to add flavor to a homemade pan gravy, or add a little stock to it and then thicken it with a thickening agent. Once you are ready to slice the sirloin tip roast, simply remove the cover and slice the beef as you would normally. You’ll see the center is nice and pink, yet you don’t have a bunch of juice running everywhere as you cut! Serves it with your pan gravy, and your favorite sides! Tender, juicy, and foolproof, this coffee rubbed sirloin tip roast is the perfect way to 'WOW' your family and friends any time of the year. 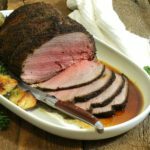 Keyword coffee rub recipe, how do you cook a sirloin tip roast?, what is a sirloin tip roast? Wash the sirloin tip roast to remove any blood, and pat it dry with a clean cloth or paper towel. Optional: If dry rubbing overnight, liberally coat the entire roast with the coffee rub mix. If not dry rubbing overnight, simply continue the recipe and skip this step. Season the roast with sprinkling of salt, and roughly julienne the Spanish onion. Spread the onion on a roasting tray as a bed for the roast. Preheat the oven to 400F and place the roast on the roasting tray. Cook the roast in the pre heated oven, uncovered for 15 minutes, then drop the temperature to 325F and continue cooking for 20 minutes per pound of meat. For a 4 lb roast the roast would be in the oven for 1 hour and twenty minutes total for medium rare. Remove the roast from the oven and let it rest covered with tinfoil for at lest 10 minutes. Let the roast rest before slicing for at least 10 to 15 minutes. Cover the roast during this time to keep it warm. Remove any juices from the roasting tray, and thicken them to make a pan gravy, or simply add the juices to a pre-made gravy. Slice the sirloin tip roast, and serve with appropriate sides. YUM! This looks delish! I have never tried a coffee rub but you make it look delish! I’m going to give this one a try!! I have never thought of using coffee as a rub on my roast. What a great idea! I can’t wait to give it a try! 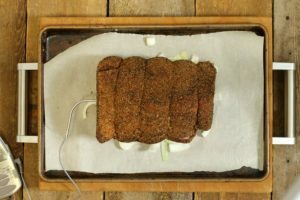 I love sirloin roast, and that rub sounds amazing! I can’t wait to give this a try! I’ve never tried coffee in a roast and it is truly a unique ingredient! But I’m sure it tastes great! Thanks for the detailed tips to making the perfect roast. I just have to try it soon. Taking on a roast can be a nerve wracking thing! All the step by step instructions and photos for this are really great! The rub sounds like the perfect amount of flavor and spice too. I hope it makes the process a little easier and less stressful over the holidays! You had me at at COFFEE RUBBED! OMG, this sound divine! It’s so good Allison! you Won’t believe how tender the roast is, and the coffee flavor is just strong enough…not overpowering at all! I’ve been on the lookout for a a good roast recipe for Christmas dinner. This looks amazing! 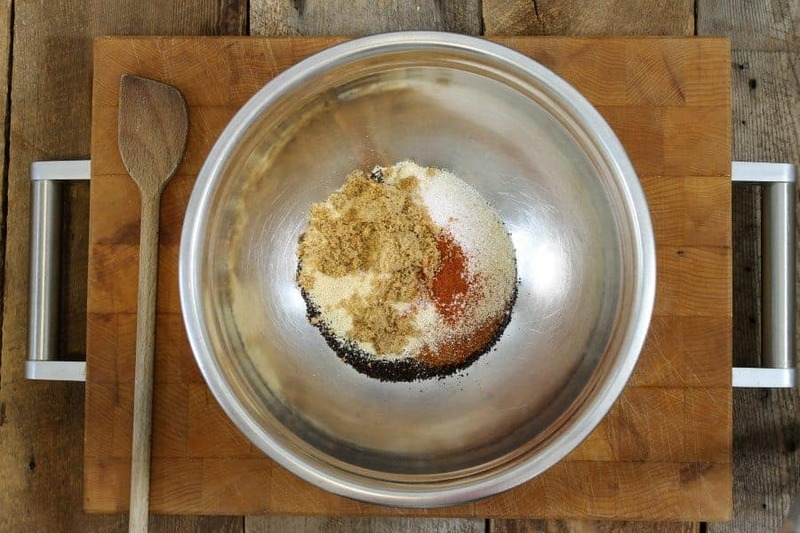 I love the the blend of herbs, spices and sugar you used for the rub! Thanks for sharing! It is! Best of all it is easy to do! Coffee in a roast rub?!?! I love it! My spice cabinet has everything I need but the roast! The coffee adds a unique element that everyone loves! Not to strong, but just strong enough that you can tell it’s there. You wouldn’t believe the smell as it roasts! Wonderful tips!!! The coffee, sugar and chipotle is an amazing flavor combination! Thank you for all of these tips! Ive always wanted to make a Sirloin Tip Roast but have always been intimidated by the process. I hope the process has been de-mystified for you Nicole! I’ve never seen a roast with sugar before, but I’ll bet that is AMAZING! So smart. Can’t wait to try 🙂 Thank you for the recipe! The sugar is there just to balance the acidity of the coffee a little! The sugar is barely noticeable in the end, but it really does effect the over all flavor! Coffee+meat, it works! It’s one of my favorite grill hacks to wow people with flavor. I’ve yet to try it on sirloin. Thanks for the inspiration. So very delicious! I must try that rub next time when I get a sirloin roast. Let me know how it turns out and tag us on social media! @earthfoodandfire!